This article is about the Chinese space program in general. For the current Chinese space agency since 1993, see China National Space Administration. The space program of the People's Republic of China is directed by the China National Space Administration (CNSA). Its technological roots can be traced back to the late 1950s, when China began a ballistic missile program in response to perceived American (and, later, Soviet) threats. However, the first Chinese crewed space program only began several decades later, when an accelerated program of technological development culminated in Yang Liwei's successful 2003 flight aboard Shenzhou 5. This achievement made China the third country to independently send humans into space. Plans currently include a permanent Chinese space station in 2020 and crewed expeditions to the Moon. Officials have articulated long term ambitions to exploit Earth-Moon space for industrial development. After the United States threatened to use nuclear weapons during the Korean War, Chairman Mao Zedong decided that only a nuclear deterrent of its own would guarantee the security of the newly founded PRC. Additionally, he wanted China to gain status among the world's powers that—as he felt—did not respect him. From this, he decided instead to only implement his new plan with the Republic of China (present-day Taiwan) as "China". Thus, Mao announced his decision to develop China's own strategic weapons, including nuclear bombs and associated missiles for the warheads, during a Communist Party of China (CPC) Central Committee meeting held on January 15, 1955. The Chinese nuclear weapons program was designated by the codename of "02". The Fifth Academy of the National Defense Ministry (国防部第五研究院) was founded on October 8, 1956, with Qian Xuesen, who had just been deported from the United States after being accused of being a communist during the red scare, as director. The Academy started the development of the first ballistic missile program, adopted on March 1, 1956 and known as the first Twelve-Year-Plan for Chinese aerospace. After the launch of mankind's first artificial satellite, Sputnik 1, by the Soviet Union on October 4, 1957, Mao decided during the National Congress of the CPC on May 17, 1958 to make China an equal with the superpowers (“我们也要搞人造卫星”) (We need to develop the artificial satellite too), by adopting Project 581 with the objective of placing a satellite in orbit by 1959 to celebrate the 10th anniversary of the PRC's founding. This goal would be achieved in three phases: developing sounding rockets first, then launching small satellites and in the final phase, large satellites. The construction of China's first missile test base, code-named Base 20 (西北综合导弹试验基地), started in April 1958 and it entered service on October 20 of the same year. The first Chinese missile was built in October 1958 as a reverse-engineered copy of the Soviet R-2 short-range ballistic missile (SRBM), itself an upgraded version of a German V-2 rocket. Its range was 590 km, weighing 20.5 tons and propelled with liquid oxygen and alcohol. China's first ever T-7 sounding rocket was successfully launched from the Nanhui launch site on February 19, 1960. China started to develop medium-range ballistic missiles (MRBM) in July 1960, with an increased range double that of the R-2. During the cordial Sino-Soviet relations of the 1950s, the USSR engaged in a cooperative technology transfer program with the PRC under which they trained Chinese students and provided the fledgling program with a sample R-2 rocket. But when Soviet premier Nikita Khrushchev was denounced as revisionist, with Mao asserting that there had been a counter-revolution in the Soviet Union and that capitalism had been restored, the friendly relationship between the two countries turned to confrontation. As a consequence, all Soviet technological assistance was abruptly withdrawn after the 1960 Sino-Soviet split. Only 17 days after the last Soviet expert had left China, the first Soviet built R-2 rocket fueled with Chinese-made propellant was launched with success on September 10, 1960. Due to Cold War tension, Mao decided in December 1963 that China should develop missile defence system capacity. During a conference held on February 2, 1964, directive 640 (640指示)was adopted (later known as Project 640). The first successful launch of a Chinese 1059 SRBM missile copy of the R-2 was conducted only two months later on November 5, 1960. The missile was also designated DF-1. The first DF-2 MRBM was tested on March 21, 1962, but failed. Development eventually continued with the redesigned DF-2A MRBM which was successfully tested on June 29, 1964. It would enter service by the end of 1966. The first successful launch and recovery of a T-7A(S1) sounding rocket carrying a biological experiment (transporting eight white mice) was on July 19, 1964 from Base 603 (安徽广德誓节渡中国科学院六〇三基地. China started to develop the DF-5 intercontinental ballistic missile (ICBM) program in August 1965. It was designed to carry a single nuclear warhead and has a maximum range of 12000 km. In November 1966, it was decided to build a second ballistic missile test site, the Northern Missile Test Site (华北导弹试验场)) in Shanxi Province, farther away from China's northern border. On October 27, 1966, a nuclear-tipped DF-2A missile was launched from Jiuquan and the 20 kilotons yield nuclear warhead exploded at the height of 569 meters over the target in Lop Nor or Base 21 situated 894 km away. On December 26, 1966, China tested its first indigenously developed DF-3 intermediate-range ballistic missile (IRBM) with success. The DF-3 was a single-stage, single-warhead missile with a maximum range of 2500 km. The development of the DF-4 IRBM began in 1967 in parallel with the single-stage DF-3. In March 1967, development started on the JL-1 submarine-launched ballistic missile to accompany the Type 092 ballistic missile submarine (SSBN) also in development. As the space race between the two superpowers reached its climax with the conquest of the Moon, Mao and Zhou Enlai decided on July 14, 1967 that the PRC should not be left behind, and started China's own crewed space program. China's first spacecraft designed for human occupancy was named Shuguang-1 (曙光一号) in January 1968. China's Space Medical Institute (航天医学工程研究所) was founded on April 1, 1968, and the Central Military Commission issued the order to start the selection of astronauts. As part of the "third line" effort to relocate critical defense infrastructure to the relatively remote interior (away from the Soviet border), it was decided to construct a new space center in the mountainous region of Xichang in the Sichuan province, code-named Base 27. A first liquid-propellant DF-3 medium-range ballistic missile was successfully launched from the Northern Missile Test Site on December 18, 1968, inaugurating the test site. In August 1969, the development of China's first heavy-lift satellite launch vehicle (SLV), the Feng Bao 1 (FB-1) (风暴一号, was started by Shanghai’s 2nd Bureau of Mechanic-Electrical Industry. The all-liquid two-stage launcher was derived from the DF-5 ICBM. Only a few months later, a parallel heavy-lift SLV program, also based on the same DF-5 ICBM and known as CZ-2, was started in Beijing by the First Space Academy. The DF-4 was used to develop the Long March-1 SLV. A newly designed spin-up orbital insertion solid propellant rocket motor third stage was added to the two existing Nitric acid/UDMH liquid propellant stages. An attempt to use this vehicle to launch a Chinese satellite before Japan's first attempt ended in failure on November 16, 1969. The first DF-4 liquid-propellant with two-stage, single-warhead IRBM was tested with success on January 30, 1970. The addition of a second-stage allowed the missile to increase its range to over 4750 km. The second satellite launch attempt on April 24, 1970 was successful. A CZ-1 was used to launch the 173 kg Dong Fang Hong I (东方红一号, meaning The East Is Red I), also known as Mao-1. It was the heaviest first satellite placed into orbit by a nation, exceeding the combined masses of the first satellites of the other four previous countries. The third stage of the CZ-1 was specially equipped with a 40 m2 solar reflector (观察球) deployed by the centrifugal force developed by the spin up orbital insertion solid propellant stage. Therefore, the faint magnitude 5 to 8 brightness of the DFH-1 made the satellite (at best) barely visible with naked eyes was consequently dramatically increased to a comfortable magnitude 2 to 3. The PRC's second satellite was launched with the last of the CZ-1 SLVs on March 3, 1971. The 221 kg ShiJian-1 (SJ-1) was equipped with a magnetometer and cosmic-ray/x-ray detectors. The first crewed space program known as Project 714, was officially adopted in April 1971 with the goal of sending two astronauts into space by 1973 aboard the Shuguang spacecraft. The first screening process for astronauts had already ended on March 15, 1971, with 19 astronauts chosen. The program would soon be cancelled due to political turmoil. A first flight test of the DF-5 ICBM was carried out in October 1971. The CZ-2A launcher, originally designed to carry the Shuguang-1 spacecraft, was first tested on November 5, 1974, carrying China’s first FSW-0 recoverable satellite, but failed. After some redesign work, the modified CZ-2C successfully launched the FSW-0 No.1 recoverable satellite (返回式卫星) into orbit on November 26, 1975. After expansion, the Northern Missile Test Site was upgraded as a test base in January 1976 to become the Northern Missile Test Base (华北导弹试验基地) known as Base 25. After Mao died on September 9, 1976, his rival, Deng Xiaoping, denounced during the Cultural Revolution as reactionary and therefore forced to retire from all his offices, slowly re-emerged as China's new leader in 1978. At first, new development was slowed. Then, several key projects deemed unnecessary were simply cancelled—the Fanji ABM system, the Xianfeng Anti-Missile Super Gun, the ICBM Early Warning Network 7010 Tracking Radar and the land-based high-power anti-missile laser program. Nevertheless, some development did proceed. The first Yuanwang-class space tracking ship was commissioned in 1979. The first full-range test of the DF-5 ICBM was conducted on May 18, 1980. The payload reached its target located 9300 km away in the South Pacific (7°0′S 117°33′E﻿ / ﻿7.000°S 117.550°E﻿ / -7.000; 117.550﻿ (DF-5 ICBM test impact)) and retrieved five minutes later by helicopter. Further development of the Long March rocket series allowed the PRC to initiate a commercial launch program in 1985, which has since launched over 30 foreign satellites, primarily for European and Asian interests. The next crewed space program was even more ambitious and proposed in March 1986, as Astronautics plan 863-2. This consisted of a crewed spacecraft (Project 863-204) used to ferry astronaut crews to a space station (Project 863-205). Several spaceplane designs were rejected two years later and a simpler space capsule was chosen instead. Although the project did not achieve its goals, it would ultimately evolve into the 1992 Project 921. The Ministry of Aerospace Industry was founded on July 5, 1988. On September 15, 1988, a JL-1 SLBM was launched from a Type 092 submarine. The maximum range of the SLBM is 2150 km. Along Deng's policy of capitalist reforms in the Chinese economy, Chinese culture also changed. Therefore, names used in the space program, previously all chosen from the revolutionary history of the PRC, were soon replaced with mystical-religious ones. Thus, new Long March carrier rockets were renamed Divine arrow (神箭), spacecraft Divine vessel (神舟), space plane Divine dragon (神龙), land-based high-power laser Divine light (神光) and supercomputer Divine might (神威). In June 1993, China Aerospace Industry Corporation (National Space Bureau) was founded in Beijing. On February 15, 1996, during the flight of the first Long March 3B heavy carrier rocket carrying Intelsat 708, the rocket veered off course immediately after clearing the launch platform, crashing 22 seconds later. It crashed 1.85 km (1.15 mi) away from the launch pad into a nearby mountain village. On the 50th anniversary of the PRC's founding, China launched the Shenzhou 1 spacecraft on November 20, 1999 and recovered it after a flight of 21 hours. The country became the third country with a successful crewed space program by sending an astronaut into space aboard Shenzhou 5 on October 15, 2003 for more than 21 hours. China has since turned its focus to extraterrestrial exploration starting with the Moon. The first Chinese Lunar Exploration Program un-crewed lunar orbiter Chang'e 1 was successfully launched on October 24, 2007, making China the fifth nation to successfully orbit the Moon. The PRC is a member of the United Nations Committee on the Peaceful Uses of Outer Space and a signatory to all United Nations treaties and conventions on space, with the exception of the unpopular 1979 Moon Treaty. The United States government has long been resistant to the use of PRC launch services by American industry due to concerns over alleged civilian technology transfer that could have dual-use military applications to countries such as North Korea, Iran or Syria, and announced an official embargo against the PRC in 2000. Thus, financial retaliatory measures have been taken on many occasions against several Chinese space companies. Due to security concerns, all researchers from the U.S. National Aeronautics and Space Administration (NASA) are prohibited from working with Chinese citizens affiliated with a Chinese state enterprise or entity. In April 2011, the 112th United States Congress banned NASA from using its funds to host Chinese visitors at NASA facilities. In March 2013, the U.S. Congress passed legislation barring Chinese nationals from entering NASA facilities without a waiver from NASA. The history of the U.S. exclusion policy can be traced back in 1998 when a U.S. Congressional Commission led by Christopher Cox discovered that the technical information that American companies provided China for its commercial satellite ended up improving Chinese intercontinental ballistic missile technology. This was further aggravated in 2007 when China blew up its space station in the low Earth orbit to test a ground-based anti-satellite (ASAT) missile. The debris created by the explosion contributed to the space junk that litter Earth's orbit, exposing American military space assets at the risk such as accidental collision. The United States also fears the Chinese application of dual-use space technology for nefarious purposes. The U.S. imposed an embargo to the U.S. - China space cooperation throughout the 2000s and by 2011, a clause inserted by then-Congressman Frank Wolf in the 2011 U.S. federal budget forbids NASA from hosting or participating in a joint scientific activity with China. The Chinese response to the exclusion policy involved its own space policy of opening up its space station to the outside world, welcoming scientists coming from all countries. American scientists have also boycotted NASA conferences due to its rejection of Chinese nationals in these events. Initially the space program of the PRC was organized under the People's Liberation Army, particularly the Second Artillery Corps. In the 1990s, the PRC reorganized the space program as part of a general reorganization of the defense industry to make it resemble Western defense procurement. However, the Strategic Support Force is still participating in. The China National Space Administration, an agency within the Commission of Science, Technology and Industry for National Defense currently headed by Sun Laiyan, is now responsible for launches. The Long March rocket is produced by the China Academy of Launch Vehicle Technology, and satellites are produced by the China Aerospace Science and Technology Corporation. The latter organizations are state-owned enterprises; however, it is the intent of the PRC government that they should not be actively state managed and that they should behave much as private companies would in the West. Guizhou Aerospace Industrial Park (贵州航天高新技术产业园)，also known as Base 061 (航天○六一基地), founded in 2002 after approval of Project 863 for industrialization of aerospace research centers (“国家863计划成果产业化基地”). Nanhui (南汇县老港镇东进村) First successful launch of a T-7M sounding rocket on February 19, 1960. Base 603 (安徽广德誓节渡中国科学院六〇三基地) Also known as Guangde Launch Site (广德发射场). The first successful flight of a biological experimental T-7A(S1) sounding rocket transporting eight white mice was launched and recovered on July 19, 1964. Fleet of six Yuanwang-class space tracking ships. Data relay satellite (数据中继卫星) Tianlian I (天链一号), specially developed to decrease the communication time between the Shenzhou 7 spaceship and the ground; it will also improve the amount of data that can be transferred. The current orbit coverage of 12 percent will thus be increased to a total of about 60 percent. Deep Space Tracking Network composed with radio antennas in Beijing, Shanghai, Kunming and Urumuqi, forming a 3000 km VLBI（甚长基线干涉）. New integrated land-based space monitoring and control network stations, forming a large triangle with Kashi in the north-west of China, Jiamusi in the north-east and Sanya in the south. Plus shared space tracking facilities with France, Brazil, Sweden and Australia. As the Space Race between the two superpowers reached its climax with humans landing on the Moon, Mao Zedong and Zhou Enlai decided on July 14, 1967 that the PRC should not be left behind, and therefore initiated China's own crewed space program. The top-secret Project 714 aimed to put two people into space by 1973 with the Shuguang spacecraft. Nineteen PLAAF pilots were selected for this goal on March 1971. The Shuguang-1 spacecraft to be launched with the CZ-2A rocket was designed to carry a crew of two. The program was officially cancelled on May 13, 1972 for economic reasons, though the internal politics of the Cultural Revolution likely motivated the closure. The short-lived second crewed program was based on the successful implementation of landing technology (third in the World after USSR and United States) by FSW satellites. It was announced a few times in 1978 with the open publishing of some details including photos, but then was abruptly canceled in 1980. It has been argued that the second crewed program was created solely for propaganda purposes, and was never intended to produce results. A new crewed space program was proposed by the Chinese Academy of Sciences in March 1986, as Astronautics plan 863-2. This consisted of a crewed spacecraft (Project 863-204) used to ferry astronaut crews to a space station (Project 863-205). In September of that year, astronauts in training were presented by the Chinese media. The various proposed crewed spacecraft were mostly spaceplanes. Project 863 ultimately evolved into the 1992 Project 921. In 1992, authorization and funding was given for the first phase of Project 921, which was a plan to launch a crewed spacecraft. The Shenzhou program had four uncrewed test flights and two crewed missions. The first one was Shenzhou 1 on November 20, 1999. On January 9, 2001 Shenzhou 2 launched carrying test animals. Shenzhou 3 and Shenzhou 4 were launched in 2002, carrying test dummies. Following these was the successful Shenzhou 5, China's first crewed mission in space on October 15, 2003, which carried Yang Liwei in orbit for 21 hours and made China the third nation to launch a human into orbit. Shenzhou 6 followed two years later ending the first phase of the Project 921. Missions are launched on the Long March 2F rocket from the Jiuquan Satellite Launch Center. The China Crewed Space Engineering Office provides engineering and administrative support for the crewed Shenzhou missions. The second phase of the Project 921 started with Shenzhou 7, China's first spacewalk mission. Then, two crewed missions were planned to the first Chinese space laboratory. The PRC initially designed the Shenzhou spacecraft with docking technologies imported from Russia, therefore compatible with the International Space Station (ISS). On September 29, 2011, China launched Tiangong 1. This target module is intended to be the first step to testing the technology required for a planned space station. On October 31, 2011, a Long March 2F rocket lifted the Shenzhou 8 uncrewed spacecraft which docked twice with the Tiangong 1 module. The Shenzhou 9 craft took off on 16 June 2012 with a crew of 3. It successfully docked with the Tiangong-1 laboratory on 18 June 2012, at 06:07 UTC, marking China's first crewed spacecraft docking. Another crewed mission, Shenzhou 10, launched on 11 June 2013. The Tiangong 1 target module is then expected to be deorbited. A larger basic permanent space station (基本型空间站) would be the third and last phase of Project 921. This will be a modular design with an eventual weight of around 60 tons, to be completed sometime before 2020. The first section, designated Tiangong 3, is scheduled for launch after Tiangong 2. Tiangong 3 will weigh 22 tons and be 18.1 metres long. Additional modules will be connected over several missions to build the space station. This could also be the beginning of China's crewed international cooperation, the existence of which was officially disclosed for the first time after the launch of Shenzhou 7. The Chinese space station is scheduled to be completed in 2020. In February 2004, the PRC formally started the implementation phase of its uncrewed Moon exploration project. According to Sun Laiyan, administrator of the China National Space Administration, the project will involve three phases: orbiting the Moon; landing; and returning samples. The first phase planned to spend 1.4 billion renminbi (approx. US$170 million) to orbit a satellite around the Moon before 2007, which is ongoing. Phase two involves sending a lander before 2010. Phase three involves collecting lunar soil samples before 2020. On November 27, 2005, the deputy commander of the crewed spaceflight program announced that the PRC planned to complete a space station and a crewed mission to the Moon by 2020, assuming funding was approved by the government. On December 14, 2005, it was reported "an effort to launch lunar orbiting satellites will be supplanted in 2007 by a program aimed at accomplishing an uncrewed lunar landing. A program to return uncrewed space vehicles from the moon will begin in 2012 and last for five years, until the crewed program gets underway" in 2017, with a crewed Moon landing some time after that. Nonetheless, the decision to develop a totally new moon rocket in the 1962 Soviet UR-700M-class (Project Aelita) able to launch a 500-ton payload in LTO[dubious – discuss] and a more modest 50 tons LTO payload LV has been discussed in a 2006 conference by academician Zhang Guitian (张贵田), a liquid propellant rocket engine specialist, who developed the CZ-2 and CZ-4A rockets engines. On June 22, 2006, Long Lehao, deputy chief architect of the lunar probe project, laid out a schedule for China's lunar exploration. He set 2024 as the date of China's first moonwalk. In September 2010, it was announced that the country is planning to carry out explorations in deep space by sending a man to the Moon by 2025. China also hopes to bring a moon rock sample back to Earth in 2017, and subsequently build an observatory on the Moon's surface. Ye Peijian, Commander in Chief of the Chang’e programme and an academic at the Chinese Academy of Sciences, added that China has the "full capacity to accomplish Mars exploration by 2013." On January 3, 2019, Chang'e 4, the China National Space Administration's lunar rover, successfully landed on the far side of the moon. The rover was able to transmit data back to Earth despite the lack of radio frequencies on the far side, via a dedicated satellite sent earlier to orbit the moon. The landing and data transmission is considered a landmark achievement for human space exploration. 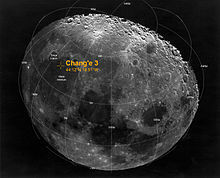 On December 14, 2013 China's Chang'e 3 became the first object to soft-land on the Moon since Luna 24 in 1976. As indicated by the official Chinese Lunar Exploration Program insignia, denoted by a calligraphic Moon ideogram (月) in the shape of a nascent lunar crescent, with two human footsteps at its center, the ultimate objective of the program is to establish a permanent human presence on the Earth's natural satellite. Annotated image of the approximate landing site of the Chinese Chang'e-3 lander. It was launched at 17:30 UTC on 1 December 2013, and reached the Moon's surface on 14 December 2013. The lunar coordinates are: 44.12°N 19.51°W. Yang Liwei declared at the 16th Human in Space Symposium of International Academy of Astronautics (IAA) in Beijing, on May 22, 2007 that building a lunar base was a crucial step to realize a flight to Mars and farther planets. According to practice, since the whole project is only at a very early preparatory research phase, no official crewed Moon program has been announced yet by the authorities. But its existence is nonetheless revealed by regular intentional leaks in the media. A typical example is the Lunar Roving Vehicle (月球车) that was shown on a Chinese TV channel (东方卫视) during the 2008 May Day celebrations. Sun Laiyan, administrator of the China National Space Administration, said on July 20, 2006 that China would start deep space exploration focusing on Mars over the next five years, during the Eleventh Five-Year Plan (2006–2010) Program period. The first uncrewed Mars exploration program could take place sometime between now[when?] and 2033, followed by a crewed phase in 2040-2060. The Mars 500 study of 2011 prepared for this crewed mission. Moreover, in order to make crewed flight in deep space toward Mars safer, a space weather forecast system was to be completed by 2017 with the Kuafu mission satellites placed at the Lagrangian Point L1. However, due to withdrawal first by Canada and then ESA, the project was indefinitely postponed. and prepare for the future exploration of Mars, Saturn, and beyond. According to the China Academy of Space Technology (CAST) presentation at the 2015 International Space Development Congress in Toronto, Canada, Chinese interest in space-based solar power began in the period 1990–1995. By 2011 there was a proposal for a national program, with advocates such as Pioneer Professor Wang Xiji stating in an article for the Ministry of Science and technology that "China had built up a solid industrial foundation, acquired sufficient technology and had enough money to carry out the most ambitious space project in history. Once completed, the solar station, with a capacity of 100MW, would span at least one square kilometre, dwarfing the International Space Station and becoming the biggest man-made object in space" and "warned that if it did not act quickly, China would let other countries, in particular the US and Japan, take the lead and occupy strategically important locations in space." Global Security cites a 2011-01 Journal of Rocket propulsion that articulates the need for 620+ launches of their Long March-9 (CZ-9) heavy lift system for the construction of an orbital solar power plant with 10,000 MW capacity massing 50,000 tonnes. By 2013 there was a national goal, that "the state has decided that power coming from outside of the earth, such as solar power and development of other space energy resources, is to be China's future direction" and the following roadmap was identified: "In 2010, CAST will finish the concept design; in 2020, we will finish the industrial level testing of in-orbit construction and wireless transmissions. In 2025, we will complete the first 100kW SPS demonstration at LEO; and in 2035, the 100MW SPS will have electric generating capacity. Finally in 2050, the first commercial level SPS system will be in operation at GEO." The article went on to state that "Since SPS development will be a huge project, it will be considered the equivalent of an Apollo program for energy. In the last century, America's leading position in science and technology worldwide was inextricably linked with technological advances associated with implementation of the Apollo program. Likewise, as China's current achievements in aerospace technology are built upon with its successive generations of satellite projects in space, China will use its capabilities in space science to assure sustainable development of energy from space." In 2015, the CAST team won the International SunSat Design Competition with their video of a Multi-Rotary Joint concept. The design was presented in detail in a paper for the Online Journal of Space Communication. In 2016, Lt Gen. Zhang Yulin, deputy chief of the [PLA] armament development department of the Central Military Commission, suggested that China would next begin to exploit Earth-Moon space for industrial development. The goal would be the construction of space-based solar power satellites that would beam energy back to Earth. Exploit Earth-Moon space for industrial development. Space-Based ASAT System small and nano-satellites developed by the Small Satellite Research Institute of the Chinese Academy of Space Technology. The Double Star Mission comprised two satellites launched in 2003 and 2004, jointly with ESA, to study the Earth's magnetosphere. Earth observation, remote sensing or reconnaissance satellites series: CBERS, Dongfanghong program, Fanhui Shi Weixing, Yaogan and Ziyuan 3. Tianlian 2 (天链二号) Next generation data relay satellite (DRS) system, based on the DFH-4 satellite bus, with two satellites providing up to 85% coverage. Beidou navigation system or Compass Navigation Satellite System, composed of 60 to 70 satellites, during the "Eleventh Five-Year Plan" period (2006–2010). Astrophysics research, with the launch of the world's largest Solar Space Telescope in 2008, and Project 973 Space Hard X-Ray Modulation Telescope (硬X射线调制望远镜HXMT) by 2010. Kuafu mission satellites for space weather forecasts was planned to be completed by 2017. However, due to withdrawal first by Canada and then ESA, the project was indefinitely postponed. Deep Space Tracking Network with the completion of the FAST, the world's largest single dish radio antenna of 500 m in Guizhou, and a 3000 km VLBI radio antenna. A Deep Impact-style mission to test process of re-directing the direction of an asteroid or comet. Tianzhou – robotic cargo vessel to resupply the Chinese Space Station based on the design of Tiangong-1, not meant for reentry, but usable for garbage disposal. Third phase, Chang'e 5-T1 (completed) and Chang'e 5 – to be launched in December 2019 to perform a sample-return. Fourth phase, Chang'e 6, Chang'e 7 and Chang'e 8 - will explore the south pole for natural resources; may 3D-print a structure using regolith. Chinese exploration of Mars – The Yinghuo-1 orbiter was launched in November 2011 in the joint Fobos-Grunt mission with Russia, but the rocket failed to leave Earth orbit and underwent destructive re-entry on 15 January 2012. Further planned missions include rover, landers and possible crewed missions in the far future. Asteroid Exploration Mission, proposed for launch around 2022-2024. Mission goals include asteroid flyby observations, global remote sensing, robotic landing, and possible sample return. Mars Sample Return Mission (HX-2), proposed for launch around 2028-2030. Mission goals include in-situ topography and soil composition analysis, deep interior investigations to probe the planet's origins and geologic evolution, and sample return. Jupiter System Exploration Mission, proposed for launch around 2029-2030, and arriving at Jupiter around 2036. Mission goals include orbital exploration of Jupiter and its four largest moons, study of the magnetohydrodynamics in the Jupiter system, and investigation of the internal composition of Jupiter's atmosphere and moons, especially Ganymede. A mission to Uranus, though tentative, has been proposed for implementation after 2030, with a probe arriving in the 2040s. It is presumed to be part of a future planetary flyby phase of exploration, and would study the solar wind and interplanetary magnetic field as well. These missions, with the exception of the Uranus mission, have either been officially approved or are in the study phase as of June 2017. The Center for Space Science and Applied Research (CSSAR), was founded in 1987 by merging the former Institute of Space Physics (i.e. the Institute of Applied Geophysics founded in 1958) and the Center for Space Science and Technology (founded in 1978). The research fields of CSSAR mainly cover 1. Space Engineering Technology; 2. Space Weather Exploration, Research, and Forecasting; 3. Microwave Remote Sensing and Information Technology. ^ a b "Exploiting earth-moon space: China's ambition after space station". news.xinhuanet.com. Retrieved May 22, 2016. ^ a b 宋薇. "Exploiting earth-moon space: China's ambition after space station". www.chinadaily.com.cn. Retrieved May 22, 2016. ^ "中国航天大事记(1956～2005)". CNSA. May 17, 2006. Archived from the original on May 15, 2008. Retrieved May 2, 2008. ^ "赵九章与中国卫星". 中国科学院. October 16, 2007. Archived from the original on March 14, 2008. Retrieved July 3, 2008. ^ a b "中国第一枚自行设计制造的试验 探空火箭T-7M发射场遗址". 南汇医保信息网. June 19, 2006. Archived from the original on February 14, 2009. Retrieved May 8, 2008. ^ "解密—640工程：中国超级反导大炮项目 图". 第三媒体. September 2, 2006. Archived from the original on May 10, 2008. Retrieved May 4, 2008. ^ "回收生物返回舱". 雷霆万钧. September 19, 2005. Archived from the original on December 22, 2005. Retrieved July 24, 2008. ^ "首批航天员19人胜出 为后来积累了宝贵的经验". 雷霆万钧. September 16, 2005. Archived from the original on December 22, 2005. Retrieved July 24, 2008. ^ "第一艘无人试验飞船发射成功—回首航天路". cctv.com. October 5, 2005. Retrieved August 2, 2007. ^ "《东方红卫星传奇》". 中国中央电视台. July 3, 2007. Retrieved August 29, 2008. ^ "江泽民总书记为长征-2F火箭的题词". 平湖档案网. January 11, 2007. Archived from the original on October 8, 2011. Retrieved July 21, 2008. ^ "中国机械工业集团公司董事长任洪斌一行来中国运载火箭技术研究院考察参观". 中国运载火箭技术研究院. July 28, 2008. Archived from the original on February 13, 2009. Retrieved July 28, 2008. ^ "江泽民为"神舟"号飞船题名". 东方新闻. November 13, 2003. Retrieved July 21, 2008. ^ "中国战略秘器"神龙号"空天飞机惊艳亮相". 大旗网. June 6, 2008. Archived from the original on December 23, 2007. Retrieved July 21, 2008. ^ "金怡濂让中国扬威 朱镕基赞他是"做大事的人"". 搜狐. February 23, 2003. Retrieved July 21, 2008. ^ "Status of International Agreements relating to activities in outer space as at 1 January 2014" (PDF). United Nations Office for Outer Space Affairs. Retrieved March 26, 2015. ^ "中方反对美以出售禁运武器为由制裁中国公司". 新浪. January 9, 2007. Retrieved August 21, 2008. ^ a b Ian Sample (October 5, 2013). "US scientists boycott Nasa conference over China ban". The Guardian. The Guardian. Retrieved October 5, 2013. ^ a b Oberhaus, Daniel (October 18, 2016). "Will NASA Ever Work With China?". Popular Mechanic. Retrieved July 31, 2018. ^ a b Kavalski, Emilian (2016). The Ashgate Research Companion to Chinese Foreign Policy. Oxon: Routledge. p. 404. ISBN 9781409422709. ^ Sample, Ian (October 5, 2013). "US scientists boycott Nasa conference over China ban". the Guardian. Retrieved July 31, 2018. ^ "航天科技游圣地—东风航天城". 新华网内蒙古频道. December 5, 2007. Archived from the original on July 24, 2009. Retrieved May 7, 2008. ^ "烟台航天城"起航"了 力争成我国航天技术发展基地". 水母网. April 2, 2005. Retrieved May 9, 2008. ^ "烟台大众网一神舟六号专题:513所简介". 烟台大众网. June 6, 2007. Retrieved May 9, 2008. ^ "航天○六一基地自主创新促发展". 国家航天局网. July 14, 2008. Archived from the original on September 29, 2008. Retrieved July 22, 2008. ^ "军事史话（第七部） 导弹部队史话". 蓝田玉PDF小说网. March 1, 2008. Archived from the original on October 7, 2008. Retrieved June 4, 2008. ^ "贝时璋院士：开展宇宙生物学研究". 新浪. November 15, 2006. Retrieved May 8, 2008. ^ "远望六号航天测量船交付将执行神七任务". 人 民 网. April 14, 2008. Retrieved April 15, 2008. ^ "我国首颗中继卫星发射成功 将测控神七飞行". 人 民 网. April 26, 2008. Retrieved April 27, 2008. ^ "天链一号01星发射现场DV实录". 新浪. April 27, 2008. Archived from the original on December 16, 2012. Retrieved May 5, 2008. ^ "精密测轨嫦娥二号 "即拍即显"". 上海科技. June 18, 2008. Archived from the original on February 13, 2009. Retrieved June 18, 2008. ^ "海南省三亚市新型综合航天测控站建成并投入使用". 中国政府网. April 25, 2008. Retrieved April 25, 2008. ^ "South Tarawa Island, Republic of Kiribati". Global Security. Retrieved June 29, 2012. ^ Londoño, Ernesto (July 28, 2019). "From a Space Station in Argentina, China Expands Its Reach in Latin America". The New York Times. 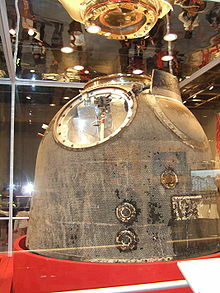 ^ "Chinese Crewed Capsule 1978". Encyclopedia Astronautica. Archived from the original on August 28, 2012. Retrieved May 13, 2009. "Encyclopedia Astronautica Index: 1". Archived from the original on August 28, 2012. Retrieved May 13, 2009. ^ "China's Crewed Space Program Takes the Stage at 26th National Space Symposium". The Space Foundation. April 10, 2010. Archived from the original on April 12, 2010. Retrieved March 15, 2010. ^ Jonathan Amos (June 18, 2012). "Shenzhou-9 docks with Tiangong-1". BBC. Retrieved June 21, 2012. ^ "Chinese Shenzhou craft launches on key space mission". BBC News. October 31, 2011. Retrieved December 6, 2014. ^ Katie Hunt and Deborah Bloom (September 15, 2016). "China launches Tiangong-2 space lab". CNN. Retrieved September 26, 2016. ^ Rui Barbosa (September 14, 2016). "China launches Tiangong-2 orbital module". NASASPACEFLIGHT.com. Retrieved September 26, 2016. ^ David, Leonard (March 11, 2011). "China Details Ambitious Space Station Goals". SPACE.com. Retrieved March 9, 2011. China is ready to carry out a multiphase construction program that leads to the large space station around 2020. As a prelude to building that facility, China is set to loft the Tiangong-1 module this year as a platform to help master key rendezvous and docking technologies. ^ "权威发布:神舟飞船将从神八开始批量生产". 新华网. September 26, 2008. Archived from the original on September 29, 2008. Retrieved September 26, 2008. ^ "China takes first step towards space station". September 20, 2011. ^ "针对我们国家登月火箭的猜测". 虚幻军事天空. Archived from the original on March 4, 2016. Retrieved November 20, 2007. ^ "中国载人登月火箭及其动力系统设想". 国家航天局网. July 25, 2006. Archived from the original on March 14, 2008. Retrieved May 9, 2008. ^ "河北院士联谊". 河北院士联谊会秘书处. Archived from the original on September 14, 2007. Retrieved November 20, 2007. ^ "news.com.com". news.com.com. Retrieved November 16, 2013. ^ "China a Step Ahead in Space Race". The Wall Street Journal. September 28, 2010. ^ "China to send man to moon by 2025". French Tribune. September 21, 2010. Archived from the original on November 25, 2010. Retrieved November 16, 2013. ^ Rivers, Matt; Regan, Helen; Jiang, Steven (January 3, 2019). "China lunar rover successfully touches down on far side of the moon, state media announces". CNN. Retrieved January 3, 2019. ^ "China lands Jade Rabbit robot rover on Moon". BBC. December 14, 2013. ^ Simon Denyer (December 14, 2013). "China carries out first soft landing on moon in 37 years". Washington Post. ^ "Astronauts share their experiences". People Daily. May 22, 2007. Retrieved May 22, 2007. ^ "China has no timetable for crewed moon landing". Xinhua News Agency. November 26, 2007. Archived from the original on February 14, 2009. Retrieved October 7, 2008. ^ "中国嫦娥探月工程进展顺利 进度将有望加快-军事频道-中华网-中国最大职业人士门户". Archived from the original on February 9, 2012. Retrieved August 11, 2017. ^ People's Daily Online. "China plans new space project probing Sun-Earth environment"
^ "China pulls plug on solar observatory". Science. October 31, 2014. ^ "戚发韧：神六后中国航天面临极大挑战". 人 民 网. January 15, 2006. Retrieved May 13, 2008. ^ Thevision (September 4, 2011). "Billion Year Plan: China Space Agency Looks To Capture Sun's Power". Billion Year Plan. Retrieved May 22, 2016. ^ Pike, John. "CZ-9 Chinese Manned Lunar Booster". www.globalsecurity.org. Retrieved May 22, 2016. ^ a b Communication, Online Journal of Space. "Online Journal of Space Communication". spacejournal.ohio.edu. Retrieved May 22, 2016. ^ "Online Journal of Space Communication". ^ Communication, Online Journal of Space. "Online Journal of Space Communication". spacejournal.ohio.edu. Retrieved May 22, 2016. ^ "Senior officer expects moon visit by 2036". ^ "China's plans for the Moon, Mars and beyond". ^ "中国深空前沿:军事潜力巨大的小卫星研究(组图)". 腾讯新闻. July 19, 2004. Retrieved May 3, 2008. ^ "The first Sino-European satellite completes its mission". ESA. October 16, 2007. Retrieved September 29, 2011. ^ "我国现役和研制中的卫星与飞船谱系图:上排右一会不会是TL-2". 虚幻天空. June 8, 2008. Archived from the original on March 3, 2016. Retrieved June 8, 2008. ^ "China constructs space information "highway"". People Daily. May 23, 2007. Retrieved May 23, 2007. ^ "硬X射线调制望远镜HXMT". 硬X射线天文望远镜项目组. April 16, 2004. Archived from the original on January 7, 2007. Retrieved July 14, 2008. ^ "500米口径球面射电望远镜（FAST）". 中科院大科学装置办公室. April 21, 2008. Archived from the original on February 11, 2009. Retrieved June 23, 2008. ^ "After US, China plans 'Deep Impact' mission - The Economic Times". Reuters. Archived from the original on August 30, 2005. Retrieved November 16, 2013. ^ "空射运载火箭亮相珠海航展". 新华网. November 1, 2006. Archived from the original on February 7, 2008. Retrieved May 3, 2008. ^ "开拓者一号乙固体运载火箭". 虚幻军事天空. July 17, 2008. Archived from the original on March 3, 2016. Retrieved July 18, 2008. ^ "CZ-2EA地面风载试验". 中国空气动力研究与发展中心. February 4, 2008. Archived from the original on February 13, 2009. Retrieved June 30, 2008. ^ "独家："神八"将用改进型火箭发射 2010年左右首飞". 人民网. June 25, 2008. Retrieved June 26, 2008. ^ "让年轻人与航天事业共同成长". 中国人事报. March 14, 2008. Archived from the original on July 15, 2011. Retrieved July 19, 2008. ^ 中国科学技术协会 (2007). 航天科学技术学科发展报告. Beijing, PRC: 中国科学技术协会出版社. p. 17. ISBN 978-7504648662. Archived from the original on September 11, 2008. ^ "国际空间大学公众论坛关注中国航天（3）". People Daily. July 11, 2007. Retrieved July 13, 2007. ^ "Chinese Crewed Space Program: The Future". Go Taikonauts!. February 4, 2006. Archived from the original on October 31, 2007. Retrieved August 2, 2007. ^ "中国空间实验室". 虚幻军事天空. February 13, 2006. Archived from the original on March 7, 2016. Retrieved July 9, 2008. ^ "中国航天921-III计划". 虚幻军事天空. July 15, 2008. Archived from the original on March 3, 2016. Retrieved April 28, 2008. ^ "China expects to launch cargo ship into space around 2016". Space Daily. March 6, 2014. ^ Morris Jones (March 3, 2014). "The Next Tiangong". Space Daily. ^ Nowakowski, Tomasz (August 9, 2017). "Chine Eyes Manned Lunar Landing by 2036". Retrieved August 17, 2017. ^ "Russia, China could sign Moon exploration pact in 2006". RIA Novosti. September 11, 2006. Retrieved September 12, 2006. ^ a b c d e Xu, Lin; Zou, Yongliao; Jia, Yingzhuo (2018). "China's planning for deep space exploration and lunar exploration before 2030" (PDF). Chinese Journal of Space Science. 38 (5): 591–592. doi:10.11728/cjss2018.05.591. ^ a b c d Wang, F. (June 27, 2018), "China's Cooperation Plan on Lunar and Deep Space Exploration" (PDF), Sixty-first session (2018) of the Committee on the Peaceful Uses of Outer Space, UNOOSA, retrieved January 23, 2019 . ^ a b "China outlines roadmap for deep space exploration". SpaceDaily. April 26, 2018. Retrieved January 23, 2019. ^ a b c d Jones, Andrew (July 14, 2017). "Mars, asteroids, Ganymede and Uranus: China's deep space exploration plan to 2030 and beyond". GBTimes. Retrieved January 23, 2019. ^ a b Jones, Andrew (July 10, 2017). "In Beijing, China rolls out the red carpet — and a comprehensive space plan". SpaceNews. Retrieved January 23, 2019. US Senate testimony on Chinese space program, given by James Oberg.